Before there was MUSCLE...before there was Monster in My Pocket...what could kids find in toy aisles to satisfy their need for little rubber monsters? Well, not much. But one notable exception is the totally awesome Canfull of Monsters, first released in the States in 1979 by Bandai America. If these guys look like Japanese monsters to you, it's because they very much are. These figures originated in Japan, featuring kaiju from the Ultraman franchise. 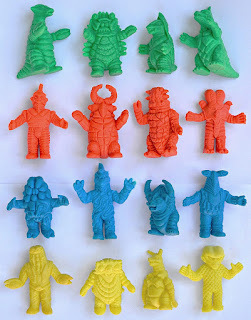 For the American market, Bandai decided to drop any connection to Ultraman and simply present the figures as random weird creatures. 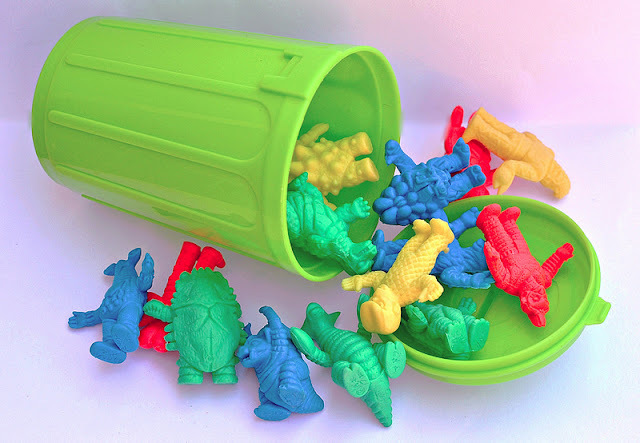 They tossed colorful plastic mini garbage cans into the mix and voilà, Canfull of Monsters was born. Around the same time (1979-early '80s), Bandai also released these figures in the U.S. a couple of alternate ways. The first came under the name Monster Toss, and included a little plastic flipper in addition to the figures and can. 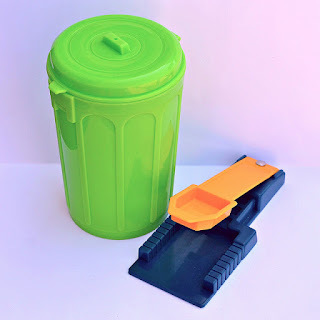 The idea was that you'd use the flipper to try to fling the monsters into the can (hours and hours of fun). 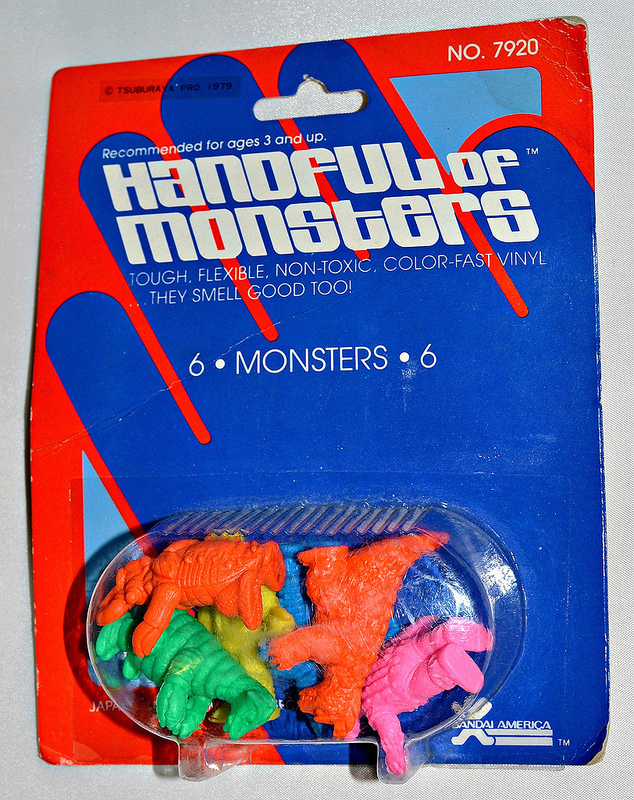 They were also released under the name Handful of Monsters, with six figures in a simple carded blister pack. Handfull of Monsters packages seem to be less commonly found than Canfull of Monsters or Monster Toss. As far as I've been able to tell, there are 16 different sculpts in the set. 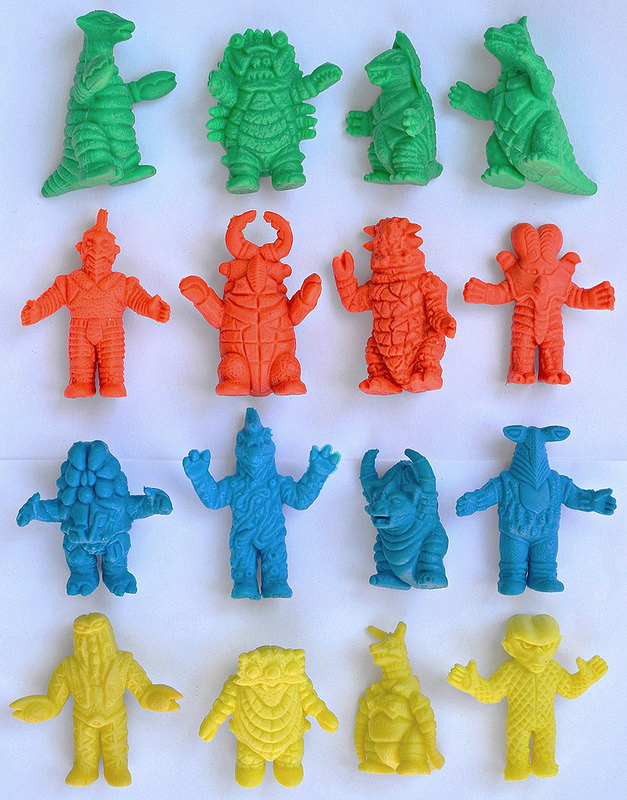 There was likely quite a few more in the original Japanese Ultraman set the sculpts were pulled from, so it's not uncommon to see additional, similar figures from Japanese releases mistaken for Canfull of Monsters. Canfull of Monsters packages contained 15 figures. Monster Toss included 12. The figures came in four main colors: blue, green, yellow and orangey red. I am pretty sure all sculpts came in all four colors. As you can see from the photo above, the Handful of Monsters packages also included pink, but I've never seen a pink figure from Canfull of Monsters or Monster Toss. They measure about 1.5" tall. The material is a soft, keshi-type rubber--the same that was used for the Japanese releases. Recognize that trash can? It re-surfaced in the 'mid '80s in the MUSCLE line, used as container packaging for the 10-pack assortments. In MUSCLE it came in a translucent white, but in Canfull of Monsters it came in solid green, red and yellow. As far as the names of the Ultraman characters that are represented in these sculpts, I'll leave that to the experts (leave a comment below to help ID them if you can!). There are definitely some odd-lookin' critters, and I'd imagine most American kids (and adults) who saw these back in the day, and had no idea they came from Ultraman, thought they were pretty bizarro. Here's a closer look at all 16 can-dwellers. Monster family photo! What do you think? 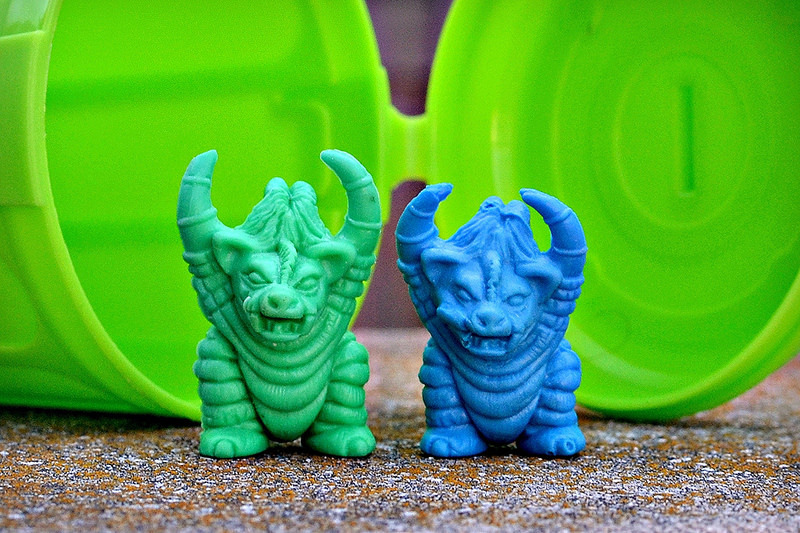 Do you own any Canfull of Monsters figures, or have any memories from back in the day? For more on this line, including photos of the Canfull of Monsters packaging, be sure to check out this post on MinifiguresXD. You can also see a photo of the Monster Toss packaging here. Never seen the "Handful of Monsters" packaging before, but I have had a couple of those pink figs before, so that explains that. I don't remember them smelling particularly good though. I was curious about that smell thing too. None of my loose figures smell particularly good, but it might have faded over the years. I wouldn't worry about the smell thing...any smell they might have once had seems to have worn off (at least in all figures I've come across). I've got all of these in fetching red, but lack the can unfortunately... So for now they're a bagful of monsters, ha! Ha! I actually got the bulk of the figures before I found a can, so of course I had to hunt down a can being the completist I am. What kind of markings are on the canful of monsters vs the actual ultraman keshi? Is there any difference? Kanji on both, or Bandai B's....etc. I'm trying to figure out which of the monsters I have are actually canful of monsters and which would be the keshi, or possibly a KO of the keshi. Love that you posted this up finally Frank! These are the coolest. Thanks Chris! I believe the markings are exactly the same (kanji on both), but I will double check. The different versions are hard to tell apart unless you have them side by side to compare size. Well most of the ones I have that are in the sculpts you have above have kanji on the feet, but nothing else; a few have nothing at all stamped on them, and then one pair of doubles I have is the guy with horns/arms raised above his head, in blue and then in a very pale pink. They are both the same size but the pale pink has no marks but the blue does. I just checked and can confirm that all of mine have the same kind of kanji markings. I think your unmarked versions are probably bootlegs. You've given me an identity to yet another line of toys I had from childhood which I didn't know the origin of! I remember giving some of mine (duplicates?) to a friend. What did the talk of the smell of the figures stem from in the comments? It's almost like it was brought up in the main article and maybe edited? 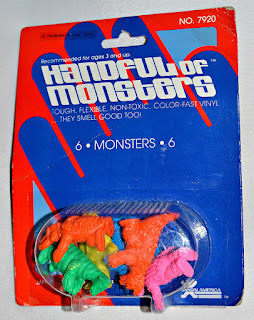 If you look at the Handful of Monsters package pic, you can see on the package it says "They smell good too!" Ah, thanks. Didn't even notice that. I guess that confirms my memory, though. These were my favorite toys as a kid! I still have about 100 of them. I always tried to read the names on their feet (in Japanese, but I thought I might figure it out).